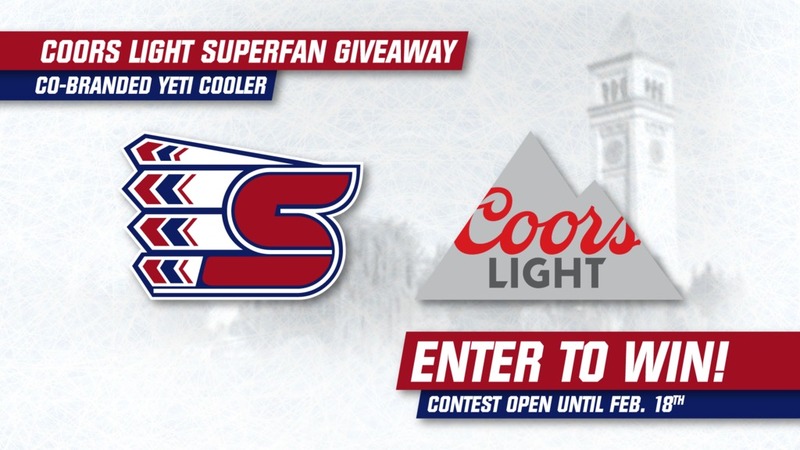 Enter for the opportunity to win a Spokane Chiefs Cooler courtesy of Coors Light! Four randomly drawn online entries will be selected to win a co-branded Spokane Chiefs / Coors Light YETI Tundra 45 cooler! Be the talk of your next barbecue, tailgate or camping trip! Entries will be randomly drawn. Restrictions apply. By checking the following box, you are verifying that: (1) you are 21 years old or older and (2) neither you nor an immediate family member are an employee of the Spokane Chiefs or the Odom Corporation. I am eligible to enter. DISCLAIMER: No purchase necessary. All accounts must be in good standing with the Spokane Chiefs. Must be able to pick up in person or coordinate pick-up (no shipping). Winners will be randomly selected. The Spokane Chiefs reserve the right to resolve any disputes regarding this contest. All decisions made by the Chiefs are final. One entry per person. Duplicate entries will be disqualified.